Most Americans can correctly identify the relative positions of the Republican and Democratic parties on the major issues of the day. But a review of what Americans know about the political parties shows that the public is better informed about the partisan affiliations of two popular recent presidents – Ronald Reagan and Bill Clinton – than it is about the positions of the parties on key issues that dominate the current national debate. 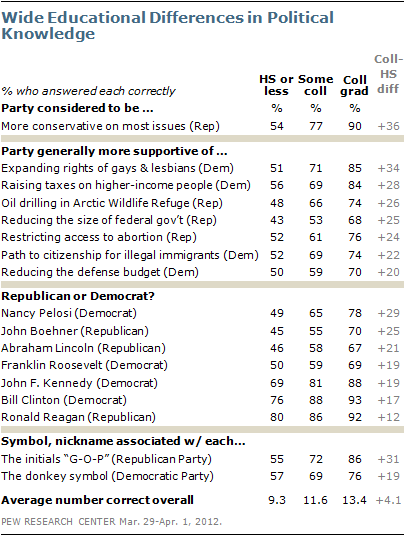 About seven-in-ten (71%) know that the Republican Party is considered to be the more conservative party. And majorities can correctly place the parties relative to each other on current issues that define the liberal-conservative divide, such as taxes, gay rights, abortion, and defense spending. But the latest News IQ survey by the Pew Research Center for the People & the Press, conducted March 29-April 1 among 1,000 adults, finds considerable variance in what the public knows about the parties. 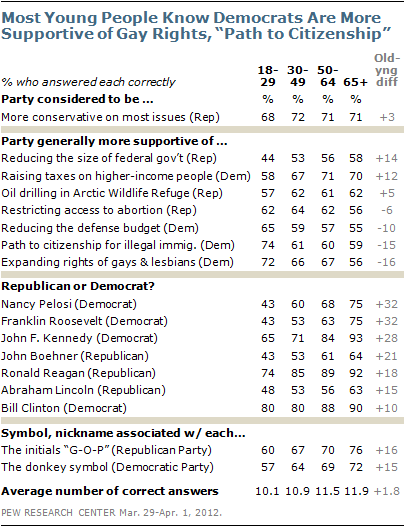 While 67% correctly identify the Democratic Party as more supportive of raising taxes on higher-income people to reduce the budget deficit, far fewer (53%) identify the Republican Party as more in favor of reducing the size and scope of government. While there is some confusion over the parties’ ideological and issue positions, two recent political figures are clearly identified with their respective parties. Overall, 85% of the public knows that Reagan was a Republican, while virtually the same percentage (84%) knows that Clinton is a Democrat. Nearly as many (78%) correctly identify John F. Kennedy as a Democrat. 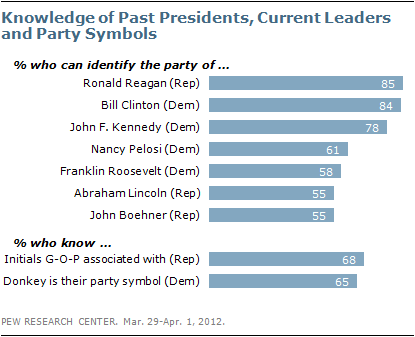 But Americans are less familiar with the partisan affiliations of earlier presidents and current congressional leaders. Roughly six-in-ten (58%) know that Franklin Roosevelt was a Democrat, while 55% correctly identify Abraham Lincoln as a Republican. Comparable majorities know that House Minority Leader Nancy Pelosi is a Democrat (61%) and House Speaker John Boehner is a Republican (55%). Two other items on the poll asked about the parties’ nicknames and symbols. Nearly seven-in-ten respondents (68%) correctly said that the initials “G-O-P” are usually associated with the Republican Party. And 65% correctly noted that the Democratic Party uses the donkey as its mascot or symbol. Republicans fare substantially better than Democrats on several questions in the survey, as is typically the case in surveys about political knowledge. The largest gaps are in awareness of which party is more supportive of reducing the size and scope of the federal government (30 points) and which party is more conservative (28 points). Republicans also are 21 percentage points more likely than Democrats to know that the GOP is more supportive of drilling for oil in the Arctic National Wildlife Refuge. There is only one policy question – which party is more supportive of cutting defense spending – on which Democrats are more knowledgeable than Republicans. Two-thirds of Democrats (67%) identify the Democratic Party as being more supportive of reducing the size of the defense budget, compared with 59% of Republicans. On the remaining issues – expanding the rights of gays and lesbians, increasing taxes on the wealthy, restricting abortion and providing immigrants who are in the U.S. illegally with a possible “path to citizenship”– there are no significant differences in knowledge between Democrats and Republicans. Republicans also are more familiar with the partisan affiliation of two leading Democrats – one from the present, Nancy Pelosi, and one from the past, Franklin Roosevelt. 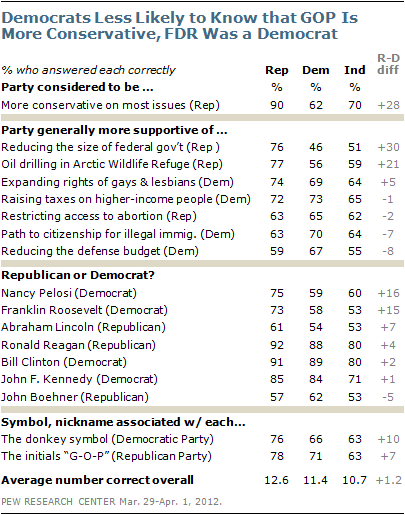 Three-quarters (75%) of Republicans know that Pelosi is a Democrat, compared with 59% of Democrats. And while 73% of Republicans identify FDR as a Democrat, just 58% of Democrats do so. Independents also are less knowledgeable than Republicans about the parties’ positions on a number of issues and the affiliation of some political leaders. Notably, independents (71%) are less likely than Republicans (85%) or Democrats (84%) to know that John F. Kennedy was a Democrat. Although previous Pew Research surveys of political knowledge have found young people to be less knowledgeable than older people, the pattern in this poll is more mixed. 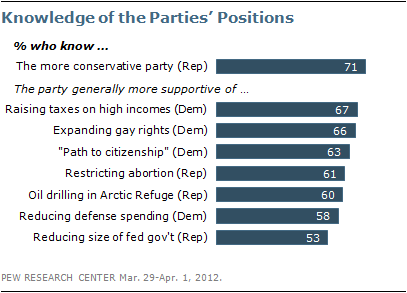 But young people are relatively well informed about the parties’ positions on most issues. In fact, people younger than 30 are more likely than those 65 and older to know that the Democrats are more supportive of expanding gay rights (72% vs. 56%) and creating a way for illegal immigrants to become citizens (74% vs. 59%). On several other issues – which party is more supportive of drilling for oil in Alaska, reducing the defense budget and for restricting access to abortion – there are no significant age differences. In addition, about seven-in-ten across all age categories, including 68% of those younger than 30, know that the Republican Party is considered to be more conservative on most political issues. However, fewer than half (44%) of young people know that the Republican Party is more supportive of reducing the size and scope of the federal government; majorities in older age categories know this. As in previous Pew Research Center News IQ surveys, there are wide educational differences in knowledge about the parties. Those with no more than a high school education are far less likely than better educated people to be aware of the parties’ positions on issues and to correctly associate political leaders with their parties.